I can think of at least another thing: the privilege of coming alongside someone and encouraging him on his journey through life. This will be my last opportunity to do that at Wheaton College in my current capacity, as I begin my fourth and final year serving as the College’s professor of military science for Army Reserve Officers’ Training Corps–or ROTC. However, my wife, Beth, and I look forward to another year of meeting more Wheaton College students, engaged couples, and ROTC cadets experiencing God in their own unique ways. The opportunity to mentor someone is one of the greatest privileges we have. Although I am often discouraged by my own sinfulness and feelings of inadequacy, I am energized by those who have a hunger to grow in the ways of the Lord and are eager for someone to encourage them along the way. I relish the opportunity to explain to a young man or woman who is considering serving his or her country that the military is desperately in need of godly leaders. Students often do not consider the military as a mission field, so I tell them the Army is in need of leaders who can share the gospel of grace with their fellow officers and soldiers all over the world. Beth and I have made some lasting memories with students who have befriended us. We try to encourage them as they prepare for an uncertain future. And although we may think we know the right answer for some dilemma, instead of telling them directly, we try to guide them through the process, letting them figure it out. As Beth and I have opened our home to students, we have found that regardless of what we feed them, they are quite content just to be in a family environment. I say it is Beth’s gourmet cooking they enjoy, but she says it’s because they just want a home–cooked meal. We have been blessed through our facilitating the engaged couples’ seminar alongside Dean of Students Rich Powers and his wife, Jennifer. It is so gratifying to see young people work out their plans to make a lifelong commitment to a future mate. Another opportunity for mentoring has come during the gatherings of Women Who Make a Difference, a group that meets twice a semester and allows women of all generations to come together with women students for fellowship. Twenty years ago, the Wheaton Alumni magazine began a series of articles, titled “On My Mind”, in which Wheaton faculty told about their thinking, their research, or their favorite books and people. 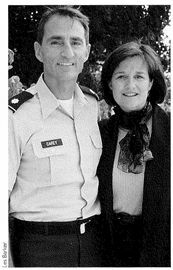 Former Professor of Military Science, Randy Carey (who taught at Wheaton since 1996-1999) was featured in the Autumn 1999 issue. Lieutenant Colonel Randy Carey has been Wheaton’s professor of military science since 1996. He holds a bachelor’s degree from Washington State University in business administration, an M.B.A. from the Florida Institute of Technology, and an M.A. in theology from Wheaton. He was commissioned in the artillery in March 1978 and was assigned to Germany. His last assignment before coming to Wheaton was in the Pentagon, working for the Chief of Staff of the Army. LTC Carey also was an assistant professor of military science at Rochester Institute of Technology in New York. He and his wife, Beth, have three sons: Ryan (12), Tyler (10), and Max (4).